White clover makes an ideal food plot crop, which feeds wildlife. It is a hardy perennial with lower seeding rates than other varieties of clover. It’s easy to plant and maintain in many regions of the United States and deer love it because of its high levels of protein. But clover is not a perfect crop. It is easily taken over by grass, and deer will stop feeding on it once the first frost of fall sends it into dormancy. You will have to plant another crop like corn to keep the deer in your area fed through fall and winter. Have the soil in your food plot tested by your local county extension office in early spring (as soon as the ground thaws). White clover prefers a soil pH that falls between 6.0 and 7.0 and the micronutrients phosphorus and potassium. Apply lime and any other nutrients dictated by the report by the end of the season. Inoculate the white clover seed. Clover inoculant creates swellings on clover's roots that enable them pull nitrogen from the air and grow. It can be purchased online (see Resources) or in certain garden centers. Simply mix the seed, inoculant and water according to the package instructions no more than 24 hours before you plan to seed. Till the soil to a depth of 4 inches with a rototiller. Rake the soil smooth and flatten it with a lawn roller. 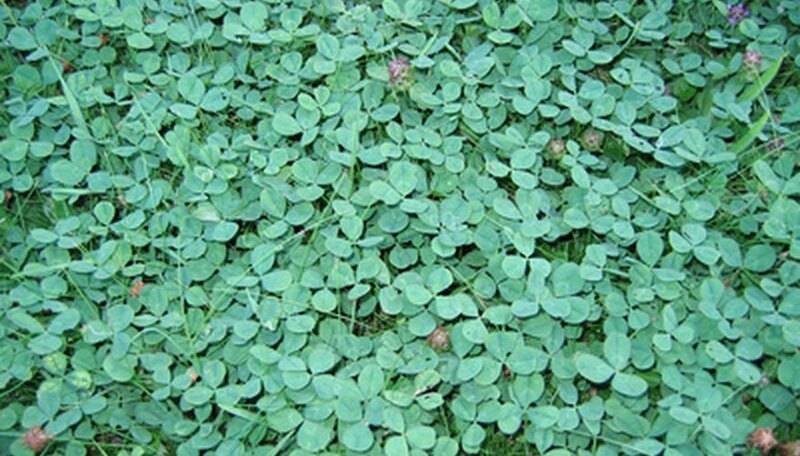 Plant clover seed between October 15 and November 15 on an overcast day, preferably after it has rained. Use a hand spreader set to 1/8 inch to spread the clover seed at a rate of 8 oz. per 1,000 square feet (purchase roughly 3 pounds of clover seed per acre). Rake the clover seed in so that most of the seed is 1/4 inch below the surface and some of the seed is still visible. Then go over the planting area with the lawn roller again. Water the planting area so that the top 3 inches of the soil are quite moist. The soil should be kept moist until the cover germinates. Supplemental water should also be given between October and May, if necessary, to keep the soil from drying out. Fertilize your clover in spring and fall with a 0-20-20 fertilizer at the manufacturer recommended rate. Roughly 5 acres of food plot, ideally divided into two plots, is needed to sustain a deer population. Any smaller and your crop will be decimated before it has a chance to grow. Test the soil once every two to three years. Every clover patch will need to periodically be re-seeded.